A true international star, he has broken 25 world records, won numerous Olympic and world titles and is considered one of the greatest  if not the best  distance runners of all time. The eighth of nine children born to family in poor, rural Ethiopia, on a maize and rice farm with no running water or electricity, Gebrselassie began running to school, 10 km away over through forests and gorges, and across rivers and muddy roads. His mother died when he was seven; his father was only convinced that Gebrselassie might make a living from running, rather than farming, when he won the 10,000m world championships in 1993. Gebrselassie suffers from asthma, a condition which, he says, persuaded him to withdraw from the marathon in Beijing, for fear that the city's poor air quality will harm his health. He could win a third Olympic gold in the 10,000m. 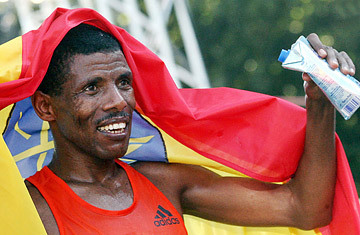 After he retires from athletics, Gebrselassie has said he wants to enter politics. A national hero, he should do well.